On our first day at the Cerro Osa Station, we met Max Villalobos, our Internship Coordinator. 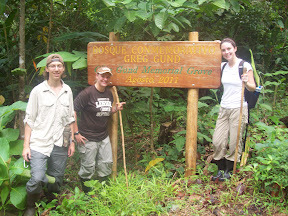 He led us on a hike through some of the beautiful trails between the Cerro Osa and Piro Biological stations. Along the way, Max taught us about the native wildlife, briefed us on Osa Conservation’s mission to promote biodiversity and awareness, and explained how we would be able to lend a hand. Our contribution would be to survey the secondary forest and create a baseline of data for their reforestation efforts, which are now in their third year. After a day of photographing several patches of forest to help document changes in the landscape, we began our surveying project with a staff member, Agustin Mendoza. 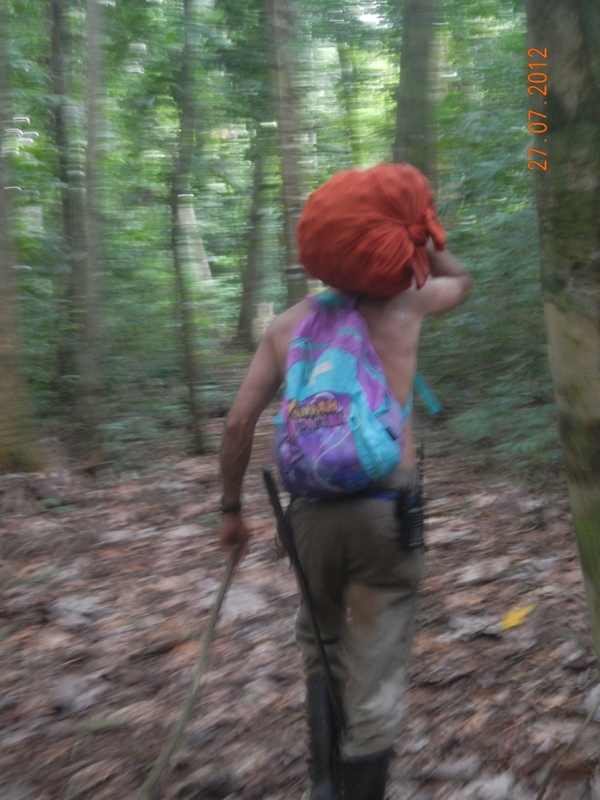 Without Agustin’s expansive knowledge of the Peninsula’s flora and fauna, not to mention his prowess with a machete, our work would have been almost impossible to complete. Over the next three weeks, we marked 117 12×12-meter subplots and took notes on the planted species within them. Additionally, we documented the percent canopy cover of each subplot and the number of Pachote trees, which are now remnants of the previous plantation here. With this data, Osa Conservation will be able to track their reforestation progress by pin-pointing the best locations for individual tree species. During our free time of those first few weeks, we were welcomed into the Osa Conservation family. Agustin became more our friend than our co-worker; he taught us some guitar, invited us to church, and even joined us on a zip-lining canopy tour! Agustin’s wife, Ania, is also an Osa Conservation employee. She worked as our cook, but she became like a second mom; showing us how to make proper pinto, plantains, corn tortillas and other Tican recipes. All of the workers were enthusiastic about our project, and talking with them allowed us to practice Spanish and gain insight to the culture and life styles of Costa Rica. In addition to making connections with the Cerro Osa staff, we had the wonderful opportunity of interacting with the staff and volunteers at Piro. We went on several weekend “turtle patrols,” in which volunteers walk the beach at night and monitor the nesting of sea turtles, actively working to ensure their safety. Watching the turtles dig their nesting pits and then returning to sea was an intriguing experience. We spent a great deal of time working with another group of volunteers from an organization called Frontiers. Although their base camp was in Piro, a few members would stay with us at Cerro Osa each week, and we worked alongside them on several occasions. Our first outing with the Frontiers was seed collecting with our fearless leader Agustin, who daringly scaled a tree without equipment, no less than 15 meters in the air to shake seeds from its branches (a feat that would be repeated and outdone on future seed collections). Then that afternoon, the same seeds were planted in the nursery. Plants grow there until they become about 15-centimeter saplings, and are then planted within enrichment transects that line the forest, another task we completed with the Frontiers. By the end of our time at Cerro Osa, all of the transects in the roughly 20-hectare plot had been filled with saplings! This July we landed in Costa Rica as three Lehigh University students eager to learn about the Osa Peninsula’s natural beauty. After living and working at Cerro Osa for five weeks, and meeting a cast of unforgettable people, this paradise feels more like a second home, one we all hope to see again soon! Thanks to everyone who made our experience possible. Pura Vida! This entry was posted in Environmental Education, Volunteers and Visitors. Bookmark the permalink.